Our father among the saints, Saint Nikolaj Velimirović (Николај Велимировић, January 5, 1880 - March 18, 1956, also rendered Nicholas) was bishop of Žiča in Serbia and the author of many Orthodox books. His most widely-known work is the Prologue from Ohrid. His first name is pronounced and sometimes written Nikolai. Nikolaj Velimirović was born in the small village of Lelich in Western Serbia. He attended the Seminary of St. Sava in Belgrade and graduated in 1905. He obtained doctorates from the old-catholic faculty of theology of Berne (1908), while the thesis was published in German in 1910, whereas the doctor's degree in philosophy was prepared at Oxford and defended in Geneva (Filosofija Berklija - Berkeley's Philosophy, in French) in 1909. At the end of 1909 he entered a monastic order and was ordained a priest the same day. He received the title of archimandrite in 1910 and was named in 1911 an assistant professor in St. Sava Seminary in Belgrade. In 1919, he was consecrated Bishop of Žiča in the Church of Serbia. In April 1915 (during WWI) he was delegated to England and America by the Serbian Church, where he held numerous lectures, fighting for the unison of the Serbs and South Slavic peoples. At the beginning of 1919 he returned to Serbia, and in 1920 was posted to the Ohrid archbishopric in Macedonia, where in 1935, in Bitola he reconstructed the cemetery of the killed German soldiers. During the Second World War in 1941 Bp. Nikolai was arrested by the Nazis in the Monastery of Žiča (which was soon afterwards robbed and ruined), after which he was confined in the Monastery of Ljubostinja (where, on the occasion of mass deaths by firing squad, he reacted saying: "Is this the German culture, to shoot hundred innocent Serbs, for one dead German soldier! The Turks have always proved to be more just..."). Later, this "new Chrysostom" was transferred to the Monastery of Vojlovica (near Pančevo) in which he was confined together with the Serbian patriarch, Gavrilo (Dožić) until the end of 1944. On December 14, 1944 he was sent to Dachau, together with Serbian Patriarch Gavrilo, where some sources, especially the standard Church references, record that he suffered both imprisonment and torture. After the War he left Communist Yugoslavia and immigrated as a refugee to the United States in 1946 where he taught at several Orthodox Christian seminaries such as St. Sava's Serbian Orthodox Seminary in Libertyville, Illinois and St. Tikhon's Orthodox Theological Seminary and Monastery in South Canaan, Pennsylvania (where he was rector and also where he died) and St. Vladimir's Orthodox Theological Seminary now in Crestwood, New York. During his time teaching at St. Vladimir's, he was very involved with the life of St. Sava Cathedral in New York City. He died on March 18, 1956. Although recently glorified as a saint by the Church of Serbia, some of his writings remain controversial. Nikolaj Velimirovic was allegedly anti-semitic. (See Bishop Nikolaj Velimirovic: Addresses to the Serbian People—Through the Prison Window. Himmelsthur, Germany: Serbian Orthodox Eparchy for Western Europe, 1985, pp. 161-162). Others regard his address from Dachau as having been under duress and point to the lack of other anti-semitic statements in the rest of his large corpus of writings. He is recorded variously to have said that the Jews "crucified Christ," but such a statement is historically no different from that in the Bible or what Christians have been saying for centuries. On May 19, 2003, the Holy Assembly of Bishops of the Serbian Orthodox Church, with one heart and one voice, unanimously decided to enter Bishop Nicholai (Velimirovic) of Ohrid and Ziča into the calendar of saints of our Holy Orthodox Church. 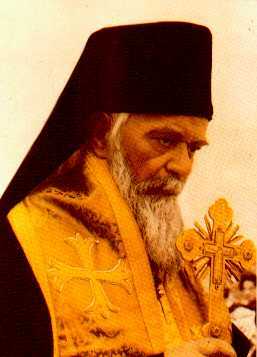 St. Nikolai Velimirovich is often referred to as Serbia's New Chrysostom. St. John Maximovitch, who had been a young instructor at a seminary in Bishop Nikolai's diocese of Ohrid, called him "a great saint and Chrysostom of our day [whose] significance for Orthodoxy in our time can be compared only with that of Metropolitan Anthony (Khrapovitsky). ... They were both universal teachers of the Orthodox Church." To grant us peace and joy in his heavenly kingdom! You served as archpastor at the church of Saint Nahum in Ochrid. You taught God's people and enlightened them with the Gospel. And for Christ you endured suffering at Dachau. Therefore we glorify you, a new Nicholas well–pleasing to God. The complete works of St. Nikolai Velimirovich have been published in twenty-three volumes by the publishing house Glas Crkve in Valjevo (Serbia). Prayers by the Lake (1922), One hundred prayers by St Nikolai . This page was last edited on May 2, 2016, at 17:33. This page has been accessed 99,579 times.